Today’s Task: Register for an Expo or Event and plan to be successful. One of the ways to really get your business moving is to participate in an Expo or events. These can be a great way to boost sales, generate hosts, and recruit new consultants. Sadly if done badly they can also be a huge waste of money and time. So what is the difference between a really great expo that will boost your business and one that is a waste? Two things, first the audience and second your preparation. All of the above have an audience that is interested in our products with the potential to become a host or consultant. Expos and events are a LOT of work. · Register—most expos and events take vender booths applications months in advance (some of them are up to a year). The registration fee is usually due long before the event date. · Create a Booth—generally at expos and events you are renting a spot of ground you are responsible to bring everything. Tables, chair, signs, samples, products to sell. Check with the event organizer before you sign up to see what they will provide. o A colorful booth with good signage is important. When I set up a booth I use the signs from The Shelf Reliance Mall but I have heard several consultants say that they have had signs made at local sign shops that are great. o I recommend having prices on EVERYTHING. Even if you have something set up just for display (like a harvest or a consolidator) have the price clearly marked. I don't usually put out this many samples at a time. This event was unique. · Prepare items for sale—make sure the prices are marked on each. On the day of the event when you are talking to people remember that they probably don’t know much about Shelf Reliance so create a few “commercials” that focus on the things you want people to know about us. When I work a booth at an event or expo I am focused on getting people to host a party, set up a Q, or become a consultant. I don’t really worry about one times sales (although I am always happy to sell someone what ever they want). In your commercial you don’t have to tell them everything just open the door for a conversation. Lead Sheet: Your Biggest Asset. I have found that many people at expos don’t want to purchase or sing up for a part right than but that they will add their contact info to a lead sheet. When I am talking to someone I might say. “The price list is 12 pages long so if you would like to look at one I would be happy to e-mail that to you. Just sign up on this sheet and I’ll get it sent out to you”. After the event is over it is time to really get to work. I recommend that within 24 hours of the end of the expo to contact everyone that gave you their contact info. I e-mail everyone and then call anyone who is interested in hosting a party or becoming a consultant. I enjoyed speaking with you about Thrive at the Shelf Reliance booth at the (insert name and place of event). You requested more information about Shelf Reliance and our products. As you requested I am attaching the 12 page price list for your reference. There is a lot of helpful information on the price list. Let me briefly explain it. · Its organized by food category. Below each food listed are the size containers it comes in. The first is a gallon or #10 can, the next is a pantry can (15 oz.can), some items come in pouches about 1 1/2 to 2 cups of food, then we have cases of pantry cans or cases of #10 size cans, there is a 5% savings when purchasing a case of any one item. · The first column is the ID# for easy ordering. · The next two columns are pricing. First is the retail price and second Q Club price. The Q club price is the price you will always pay when you set up a Thrive Q. It’s a convenient way to get your food storage consistently on a budget you can afford. Let me know if you'd like more information about setting up your personal Thrive Q. · The column next to Q club pricing is the number of servings in the container. These are listed in 1/4 cup dry servings. · Lastly we have the Shelf Life columns. 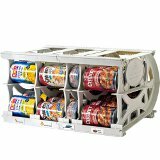 Optimum sealed shelf life, meaning below 70 degree and low light, and the last column is the amount of time you have to use the products once you open a can, pouch or bucket. If you have any questions about Thrive, Shelf Reliance or preparedness in general don't hesitate to call or email me. If you'd like to share Thrive food with your neighbors or family I am happy to schedule a demonstration at your home where you can earn free and reduced priced product. If you are ready to purchase please remember that you always get the best price by ordering through a consultant. You can order from my website: (insert URL), e-mail me (insert e-mail) or call me at (insert phone number). As your personal food storage consultant I truly want each of my customers to be thoroughly prepared with the best long term food on the market. I was scrutinizing our home party price list this weekend and found this FABULOUS deal for anyone who wants to order through me! You won't find this deal anywhere else. Only through an Independent Consultant. 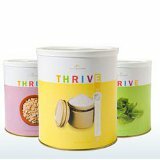 The THRIVE™ Fruits Variety Pack $112.20. For only $112.20! Blueberries alone are $41.29! You save $62.64 or 36% off home party pricing! It’s like getting 2 cans of fruit for free. On the back end there is a Lead Sheet to use at expos and event but I don’t like it (the spaces are too small to write in) so I modified to.